Smooth, creamy and full of all the flavors of summer! 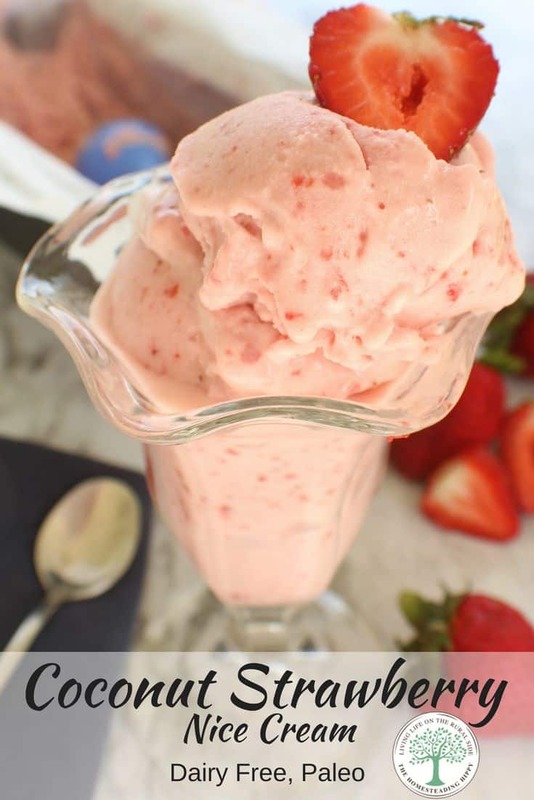 This coconut strawberry nice cream is quick, easy to make, and a dairy free ice cream substitute! The Frenchman loves ice cream. Anyone who knows him can easily testify that he would never turn down ice cream, no matter what time of day it is. However, he is also a connoisseur of sorts of all things food. Anything that I want to be Frenchman approved has to go through many taste tests and trial runs. Understand of course, that his love of ice cream does not usually extend to anything other than mint, chocolate, cookies or any combination thereof. Dairy free ice cream is nearly an abomination to him and his palette. And if it doesn’t have regular sugar? Yeah, that’s pretty much a no go to him. He says he can tell when something doesn’t have regular sugar from the get go. I’d have to agree, he’s pretty quick on that draw. So, why would I make him a dairy free, naturally sweetened ice cream? Don’t I know better? The first idea is reducing sugar in our diets. Sugar causes blood insulin levels to spike, then crash. The higher a food is on the glycemic index, the more your blood sugar can spike, and the harder the crash when it comes back down. It’s being said that increased insulin levels can cause inflammation in the body. Coconut sugar actually is not from the nut itself, but from the flower of the coconut palm tree. That flower is what turns into the coconut fruit in time. But, when the unopened flower is thinly sliced, sap can ooze out. This is collected in containers, the boiled and dried to form what we know as coconut sugar. Some studies are also looking into whether or not dairy causes inflammation in some people as well. The reason dairy is inflammatory to some is that they are not able to digest the lactase in the dairy. It’s thought that some humans lose the ability to digest lactase as they age. (source) But, is dairy really the problem, or what we are doing to the cows that give us milk? Can you have dairy without inflammation? The answer would be yes, that most people CAN consume dairy, without an issue. The only reason to avoid dairy would be if you are allergic to it. Now, medically speaking, my hubby can’t have dairy. He did have testing to prove he needs to avoid it like a plague. That’s one of the reasons we use coconut milk in this nice cream. Of course, if you don’t like milk, or just want a low carb, paleo option, using coconut milk instead of regular milk is a great option. It’s medium chain fatty acids may also help protect against heart disease. (source) Coconut milk also provides a tropical flavor to this nice cream. Since you can find coconut milk in cans that store on a pantry shelf, it’s also more of a food storage friendly option. All in all, this nice cream is a win-win! 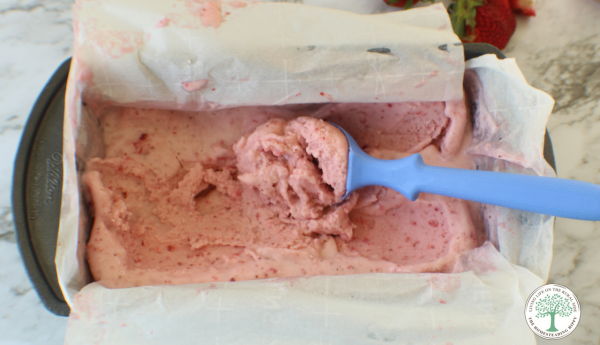 Adding in frozen strawberries will help this to freeze faster, but you CAN use fresh bought or foraged strawberries, too. If you want to add a different flavor, sub out the coconut sugar for maple syrup. Subbing out the sugar for erythritol can also make this low carb, and more keto friendly! 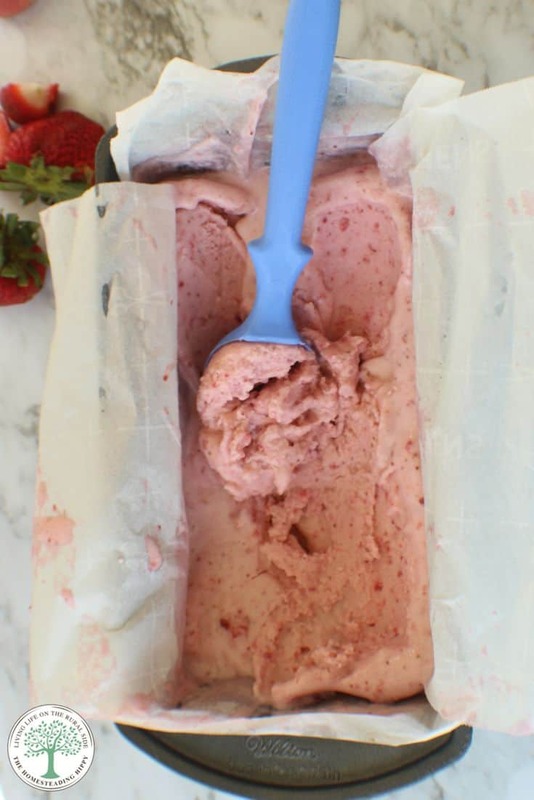 Are you ready to enjoy all the flavors of this coconut strawberry nice cream? Will you try this tonight? If using fresh strawberries, stem and slice into quarters. If using frozen strawberries, proceed with next instruction. Add all ingredients to a blender and blend for 2 minutes. You don't want all the strawberries blended in completely. Freeze for 2 hours until firm. Hi Heather, this sounds great! I didn’t know you could make ice cream this way. I always thought you needed an ice cream maker and even then it doesn’t always come out right. I can’t wait to try this. By the way, can you do this with other fruits as well? absolutely! it should work with just about any fruit you’d like!